French Onion is one of my all time favorite soups. I love the delicious and rich flavor of it. And even though it’s been in the high 80’s this week, it’s been one of those weeks where I’ve needed some comfort food. But while I was enjoying a bowl of my favorite soup, I got the idea to make a casserole using the same flavors. While I wanted the casserole to have the same flavors as the soup, I wanted to add some protein to it as well. I also wanted it to be kid-friendly. Making and cleaning up two meals because the kids won’t eat one is not something I’m inclined to do. It makes life much, much easier when the whole family eats the same thing. 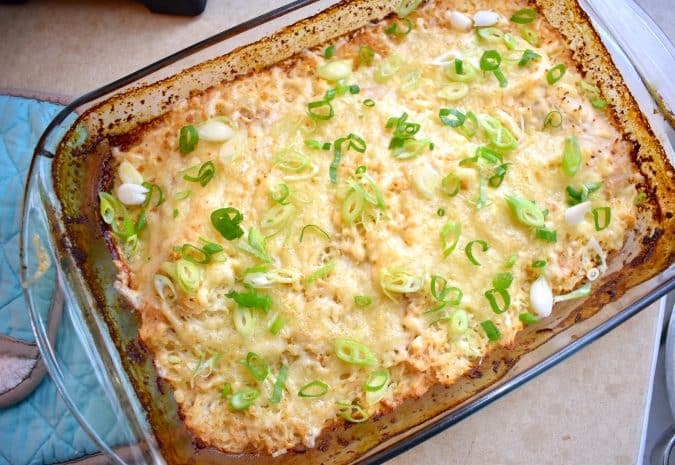 With some different ideas and ingredients, I came up with this delicious, creamy and comforting French Onion Chicken Casserole. I love how easy it is. And I was able to keep the ingredients relatively simple, which really helps. In fact, many of the ingredients are ones that you probably even have on hand. French Onion Soup is something that is frequently served as a starter in fancy restaurants. It’s rich and topped with a “croute” or slice of bread and broiled cheese. While there’s no one standard recipe for the soup, there are some characteristics that can be found across almost all the recipes. It was those similarities that I used to make my casserole. The actual French Onion Soup that we know today is a modern version that originated in Paris, France during the 18th century – hence the name. However, it is often thought that the actual soup itself dates back several more centuries, maybe as far as the Roman times. Throughout history, onions were inexpensive and plentiful, so traditionally, this soup was a meal for the poor. Modern French Onion Soup is made with a beef broth (and sometimes chicken broth is added too) and caramelized onions. The key is that the onions are cooked very slowly, which allows them to caramelize and have that rich and delicious flavor. Often brandy or sherry (or a wine) is added towards the end. The soup is then topped with a slice of bread (“croute” or crouton) and then sprinkled with cheese and broiled. One of the definite advantages of this casserole is that it’s amazingly quick and easy to put together. In ten minutes you can have it ready to go in the oven and an hour later, you’ve got a delicious casserole. The key, I found, was adding the onion soup mix. It added the right flavors that I was looking for without having to spend the time to caramelize the onions and slow cook them before adding them to a casserole. The rice and chicken work perfectly with the rich and delicious onion flavor. It’s a win for me. The whole family can eat it and the whole family likes it! The leftovers heat up well for another meal, or lunches later in the week. I like to serve my French Onion Chicken Casserole with roasted asparagus or broccoli to add color and make it a complete meal. And, if you’d like another French Onion inspired recipe, check out my Roasted French Onion Potatoes. Or, go for my classic and delicious Low Calorie French Onion Soup. An easy comfort food recipe that is incredibly filling, and full of amazing onion flavors. Preheat oven to 350 degrees. Spray a 9 x 13 baking dish with cooking spray. In a medium sized bow, combine the rice, onions, milk, broth, cream of chicken soup, and onion soup mix. Stir well. In another bowl, toss the chicken breast fillets with olive oil, making sure to coat evenly. Then season with onion powder, sat, and pepper. Pour the rice mixture into the baking dish. Nestle the chicken into the rice. Cover with foil, and bake for about 45 minutes, stirring once, halfway through. Remove foil, top with the Swiss cheese, and return to oven for another 10-15 minutes, or until cheese is melted and bubbly. Top with scallions before serving. I made this tonight, and I loved it. I’d air on the side of adding too much broth. Other than that, this was delicious and very rich for little points. Thanks for the recipe! Let me preface this by I love this website and have never disliked a recipe till now. I followed the instructions and it did not say to cook anything prior like the rice or onions and even after adding an extra 30 minutes the rice and onions were crunchy and the casserole was soupy. Total recipe fail. Next time I would sauté the onions and cook the rice and reduce the liquids by half. I had the same problem, I ended up cooking it an additional 40 minutes and finally the rice and onions were cooked and it got thick. I’m confused. The recipe says it makes 4 servings, 9 smart points per serving. Then at the end of the recipe, the notes say 4 smart points per serving. Can you clarify? I’m thinking maybe it makes 8 servings at 4 SP, or 4 servings at 9 SP. It was a typo and has been corrected Thanks for the catch!! I realize I am sometimes “blind”, but where is the PRINT option? Many thanks!! What is the sodium content for this recipe? Thank you. This looks so good but I am confused, is it 4 smart points or 9? Your title says 9 but the recipe shows 4. I am anxious to try it. Love recipes that you have all the ingredients on hand. Thank you. Really enjoy your recipes! Thanks for catching that Linda…it was a typo and I corrected it. The recipe is 9 Smart Points.